Media training is about much more than your delivery on camera. Good media trainers educate you on how to work well with all types of people who work in the media — TV producers, radio producers, print editors and writers. They each have specific needs, but there are some things that many members of the media who I have interviewed agreed upon. 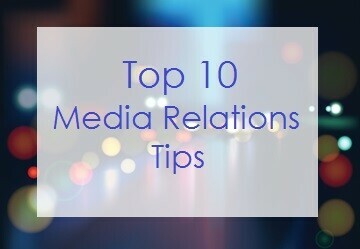 This is the list of media relations tips that I created, based on what I have learned while working with the media over the last 20+ years. 1. Be polite and respectful. Editors, journalists and producers are paid to find stories that will interest their respective audiences. In essence, they are the experts on their particular media outlets. If they tell you that your story is not right for their audience, believe them. This does not mean, however, that you can’t offer them another story unless they have told you that YOU are not right for their respective media outlets. Good manners go a long way, too. 3. Read the nonverbal, aural cues. If you are speaking to a member of the media on the phone and he or she sounds very busy, quickly explain the highlights of your pitch and offer to send the rest of the information via e-mail. 4. Sometimes less is more. Many media pros have said that they don’t have a lot of time to read through long e-mails, so a couple of paragraphs are all they want. 5. Don’t send attachments with your emails, unless they’re requested. Most members of the media don’t want you to send attachments with your emails, unless they request them. Put your pitch into the body of the e-mail. Offer to send photos or include links to photos in your e-mail. (Don’t expect the media to download photos from ftp sites: they’re too busy for that.) If you have to send several photos at once, consider using Hightail or another service that allows you to send large files. This will eliminate the need to send several e-mails with photos. It’s all about making it easy for the members of the media to work with you. 6. Include video links in your e-mails when pitching the media. Make it easy for TV producers to see how fabulous you are on camera. Now, many print outlets and radio shows want video to post on their web sites, so include the video links in all your pitches. 7. Respond to media requests quickly, usually within 24 hours or less. When writers and producers are working on a story they are usually under a tight deadline. If you don’t respond quickly they may move on to someone else. 8. Don’t try too hard to control the story. I have seen people lose press opportunities because they tried to re-schedule a TV shoot or they have pushed to have certain content included, instead of what the producer or writer wanted to cover initially. You can offer your ideas, but pushing too hard can unravel a great media placement. Good media relations are developed when you are aware of the difference between a paid ad and a press opportunity. They are vastly different. 9. Offer extra valuable information. If you have pertinent information, such as common misconceptions or new research, that could help the producer or writer with his/her story, offer it. Members of the media count on experts they interview to fill in the blanks for them. When you have an interview scheduled, be sure you’re ready! Have your press kit together, have your elevator pitch and key messages so set that they just spill out of you naturally and get media training. If you want to find out if my media training services are a good fit for you, set up a complimentary consultation call. To read my Top 5 Mistakes to Avoid in Media Interviews, click here. For Media Training Tips on The Language of Your Brand in Media Interviews, click here. Prepare for TV Interviews BEFORE You Book One. Click here. If you would like to reach our office, call 310-479-0217.